You gorge on fiery Schezuan, scorching Indian, simmering Thai and spicy Mexican, even as tears flow freely down your eyes. Your tongue is on fire, and yet, you’re addicted to the energy rush that capsaicin generates. Now picture these recipes without a good dose of red or green chillies. Five hundred years ago, before chillies travelled from America to Europe and the rest of the world, hot spices in food were limited to mustard, cloves or horseradish, and peppercorns if you could afford them. But these ingredients could never match the heat factor of chilli peppers. This isn’t the only reason why cooks and foodies eagerly adopted this non-native spice and made it their own. There is more to this zesty ingredient than mere hotness. Chillies are great sources of Vitamin B6, C, A and K, manganese, potassium, copper, folate and thiamine. While a medium-sized orange contains 36.11 mg of vitamin C, a single red chill has 64.67mg and one green chilli contains 109.13mg of vitamin C. In addition to health enhancing compounds like capsaicin and lutein, they contain high levels of antioxidants and carotenoids. – Chilli boosts your metabolic rates. Capsaicin in chillies causes a temporary increase in metabolic rates which helps your body burn more calories. According to different studies, consuming foods with chillies can both suppress your appetite and make you feel satiated. – Chilli has detoxifying properties. You can use chilli peppers as detox weapons to remove waste from vital organs. It also aids the digestive process. Try to have chilli beans and pita for breakfast instead of your usual pancakes! – Chilli pepper protects you from blood clotting. Capsaicin acts as a blood thinner and protects you from life-threatening blood clots. – Antioxidants and cartenoids in chilli prevent cell damage. This spice contains high levels of vital antioxidants that remove toxic free radicals from the body. Vitamin C in this spicy fruit helps improve your immune system and protects against chronic diseases. – Chilli is anti-inflammatory and provides relief from pain. Researchers at University of Buffalo have found that capsaicin stimulates nerve receptors which respond by flooding cells with calcium. This reduces pain in joints and muscles. They also work on pleasure receptors in the brain and help you relax. – Chilli peppers can offer relief from colds and congestion. Have a hot curry or a spicy salsa dish and you’ll notice your congestion clearing up quite a bit. Chilli helps clear the lungs and reduces symptoms of wheezing and asthma. It acts as antibiotic and fights infections. – Chilli keeps your heart healthy. Compounds like folic acid, Vitamin B6 and cartenoids can lower the levels of bad cholesterol in your body, prevent damage to blood vessels, protect your heart and reduce the risk of cardiac arrest and stroke. – Scientists argue that chilli consumption can help prevent certain cancers. Lycopene, a cartenoid found in this spice can prevent cancer in breast, colon, prostrate and lungs. This antioxidant can also reduce inflammation in lungs caused by heavy smoking. 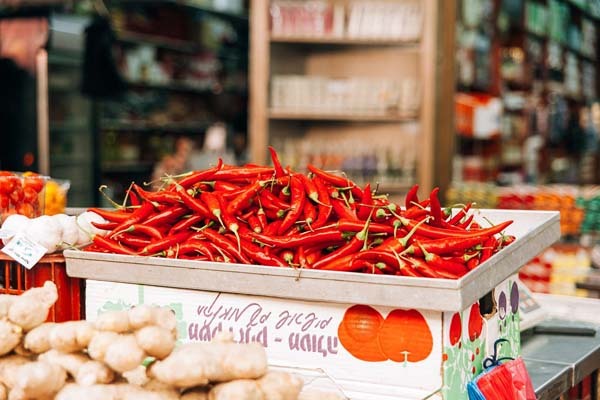 With all the amazing nutritional and medical properties that chilli peppers have to offer it is also important to mention that overconsumption might lead to negative consequences, especially for people who are highly sensitive to spicy food. So enjoy your chilli in moderation, use milder types if you are not a great fan of heat in your stomach and take a full advantage of various health benefits they offer! TOKYO Cooking Class: Learn How to Make Sushi at Home!